Sarah McCaslin, America’s Best Intern, Nate Abegglen, Youth Intern, and Michelle Toukan, Marketing Director join Community Partners staff. 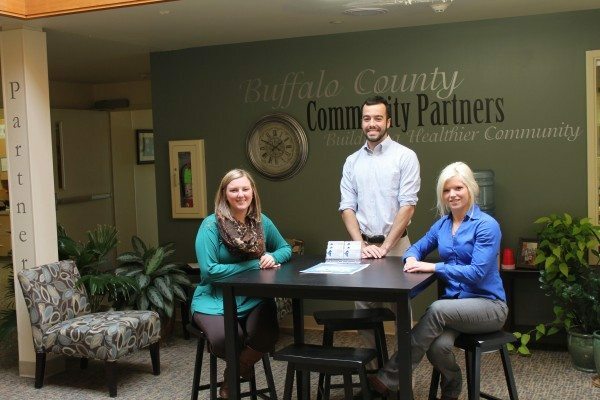 Buffalo County Community Partners welcomes a new Marketing Coordinator, Michelle Toukan. Toukan is a 2015 Hastings College graduate with a bachelors in Advertsing/Public Relations and minors in Visual Media and English. She will be working with the different coalitions to boost their visibility and communication within the community. “Michelle joins us with exceptional experience as a recent college grad, she will bring her internship experience of working for Heart Hero’s during Omaha’s 24 hr giving program. An amazing experience to assist Buffalo County Community Partners in launching their Give Where You Live Campaign.” stated executive director, Denise Zwiener. Josh Arias has been promoted as the part time Youth Coordinator. He will primarily be working with the Photo Voice project, but he will also work with the Youth Advisory Board. Arias interned with Community Partners starting in 2014. “I have a dream of starting my own non profit someday, this will be great experience,” Arias said. Nate Abegglen was brought on as a “Youth Intern.” Abegglen is a Senior Advertising/Public Relations major at UNK. He is going to be helping with Positive Pressure and YAB.